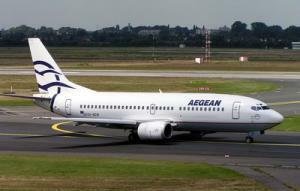 Israeli Jewish passengers on an Aegean Airlines flight from Athens to Israel had asked Greek security officials to remove two Arab Israeli passengers from the airplane because these two passengers looked “suspicious.” The police was called to examine the two Arab Israelis’ papers and luggage, and check their names against European terrorist watch-list. The police found nothing unusual, but the Jewish Israeli passengers insisted on the removal of the two Arab Israelis, and the two accepted the captain’s offer to stay one more night in Athens at Aegean Airline’s expense. Some Israeli Jewish passengers who were still in line to board the plane, refuse to get on board unless the two passengers were removed. The Jewish Israeli passengers told the plane’s captain that they were uncomfortable with the presence of the two Arab Israeli passengers, and demanded that the papers and luggage of the two be double-checked. The captain called the Athens’ police, and police officers took an hour-and-a-half to go through the two Arab Israelis’ papers and luggage, and check their names against European terrorist watch-list. After the thorough investigation, the police told the captain and the passengers that everything was in order with the two passengers, and that there was no reason to remove them from the flight. Still, the Jewish Israeli passengers insisted on the removal of the two Arab Israelis, and the two accepted the captain’s offer to stay one more night in Athens at Aegean Airline’s expense. A small group of Israeli passengers vocally and aggressively demanded that two passengers on the flight from Athens to Tel Aviv be checked for security reasons. We are sorry to note that that group [of Israeli passengers who demanded the security checks] profiled those passengers [the two Arab Israeli passengers], who, too, were Israeli citizens, based on their ethnicity. The flight captain, worried about the security of the flight, decided not to take any risks and delayed take off in order to involve the police in checking those passengers’ papers and luggage, an investigation which took some time and which found nothing unusual. While the police investigation was going on, a larger group of passengers caused commotion at the airport because of the delay and the manner in which the situation was handled, even though the investigation had already begun and, at the end, it was found that everything was in order.